t was back in September 1985 that two SMA priests, both former missionaries in Liberia, west Africa [John McCormack and Pat Kelly] set foot on Philippine soil to begin a new venture – the presence of the SMA on the continent of Asia. Six months after their arrival, the SMA Good Shepherd Parish was formally inaugurated by Cardinal Sin; construction of the parish church began the following year and was completed in 1989, together with the parish house. A House of Studies, to train Filipino seminarians who wanted to be missionaries in Africa, was also opened, in one of the eight cities that make up the Metro Manila area: Quezon City. This was followed a few years later with the opening of the International Spiritual Year Centre, Silang (ISY), in 1992. Pictured above are the 2012 / 2013 Silang class with some SMA priests. From left they are Fr Roy Maraña SMA, Pradeep Mathe (India), Josiah Kimiri (Kenya), Fr Gus O’Driscoll SMA (Good Shepherd parish, Manila), Daniel Dognran (Togo), Joel Mara (Togo), Mariel Sumallo (Philippines) and Fr Joseph Nomhwange SMA (from Nigeria, a member of the Formation staff). Since the first class in 1992, ninety-eight students (from Kenya, India, Ireland, Philippines, Togo and the USA) have undertaken their Spiritual Year programme at Silang. Of that number, forty-five are now SMA priests working in Africa and other parts of the world. The present ISY Superior, Fr Robert Sagayam SMA (from India) was a student here in 1996 / 1997. He returned there as part of an international team in 2010. 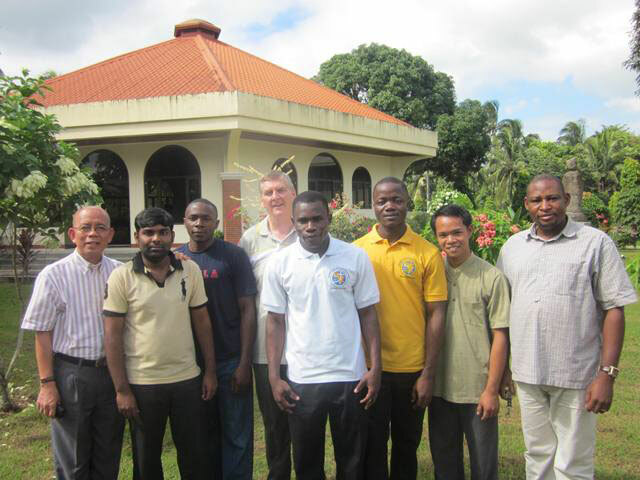 In 2011, for the first time, African SMA seminarians came to Silang for their Spiritual Year programme. Up to then, they attended the ISY in Centre Brésillac, Calavi, Republic of Benin in west Africa. This new venture will help to build links between the newer branches of the Society and help to form international teams for mission in Africa. Dinnes O Fideles (Philosophy), Bernie S Babol (Theology), Fr Alan deGuzman (SMA DF Superior), Ernesto A Garay Jr (Initiation programme) and Edmon Marquez (a seminarian with the Society of Mary, Queen of Apostles). Three SMA priests are on the staff of New Manila: François dePaul Houngue (from Togo) and two Filipinos, Jerson Pineda and Alan Cañoneo. Originally linked with India as the Asian Foundation today our Philippines unit stands on its own feet as the Philippines District-in-formation [PhDF]. Founded with the assistance of Irish, Dutch and American SMAs, today the PhDF has an all-Filipino adminstrative Council with Fr Alan deGuzman as Superior.